Is Leader Standard Work A Thing? It is a recurring expression in forums, conferences, and papers about Lean Leadership, but unclear because of the ambiguity about both leaders and standard work. This is a screen shot from yesterday’s evening news on the France 2 channel, part of a story about TGV high-speed trains used on regular tracks to bring vacationers to ski areas. The TGVs, of course run at regular speeds on these single line tracks and must stop at sidings to let regular trains through in the opposite direction. In an earlier post, I discussed the charts invented by Charles Ybry in 1846 for railroad scheduling, and this newscast shows that they are still used in railroads today. 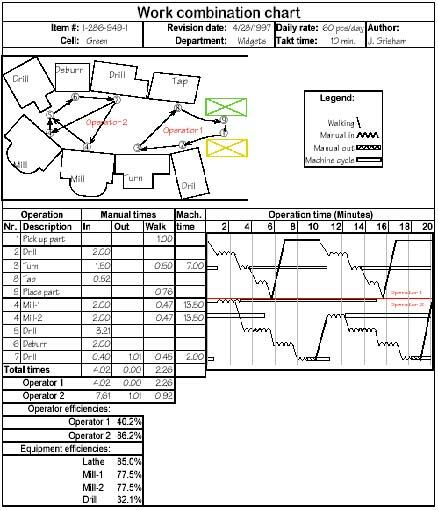 Besides railroad scheduling, they are also used in the management of multiple, concurrent projects, and I believe they were the basis for Toyota’s work combination charts. The x-axis is time; the y-axis, position along the line. On the chart, the downward lines represent trains going down the line; the upward lines, trains coming up the line. When and where the lines cross, trains cross, and there must be a siding available. 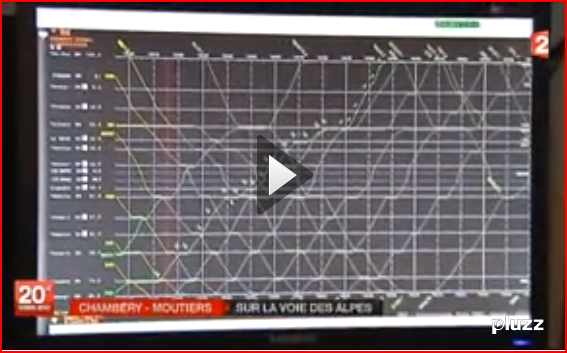 The news story had the TGV pilot call in his position on a siding to a control center in Chambéry where the chart was displayed. On the high-speed TGV lines, the signalling is all electronic, and the system automatically knows where the trains are; when you run a TGV train at reduced speed on a regular line, however, it seems that the driver has to report what happens the old-fashioned way. In the Legend, “Manual In” refers to time spent by the operator on the machine with it stopped; “Manual Out,” time spent on the machine while it runs. To this date, in the US, this powerful technique is far from enjoying the popularity it deserves. It is generally perceived as “too complicated” and I still don’t know of any software tools that fully support it. In designing jobs that involve interactions between human and machines, however, the consequence of not using it is leaving about 50% of the potential productivity improvement on the table. It may take a project team an extra day to do it, but the result is achieving a 40% productivity increase instead of 20%. Details are discussed in Chapter 7 of Working with Machines.